Are Real Madrid already out of the La Liga title race? The reigning champions slipped 10 points behind Barcelona at the top after a draw with rivals Atletico. Real Madrid's Cristiano Ronaldo reacts to a missed chance. 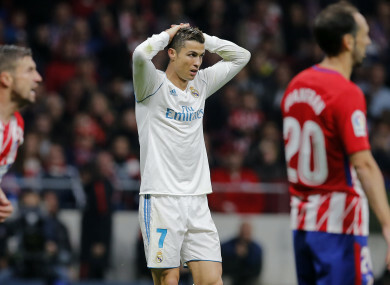 REAL MADRID AND Atletico Madrid slipped 10 points behind Barcelona at the top of La Liga as a Madrid derby short on chances finished 0-0 at Atletico’s Wanda Metropolitano on Saturday. Angel Correa missed the best chance of the game after just three minutes as both Atletico and Real were left to rue a familiar lack of cutting edge in front of goal this season. Jan Oblak turned Toni Kroos’s effort behind at the near post after a neat one-two with Ronaldo, before Sergio Ramos was left bloodied and eventually replaced at half-time as he was caught by Lucas Hernandez as he stooped to head into the side-netting. Ronaldo’s profligacy has been blamed for Real’s slump in form this season and the Portuguese was once again wayward when handed the chance to win the game 15 minutes from time. Modric picked out the World Player of the Year unmarked inside the Atletico box, but Ronaldo’s tame effort dribbled wide. Both sides had chances to win it in a frantic finale as Raphael Varane headed Kevin Gameiro’s lobbed effort off the line. At the other end, Ronaldo took just too long to wind up his effort as Hernandez galloped back into position to make a brave block and ensure Atletico a share of the spoils. However, Barca rubbed salt into Leganes’ wounds when Paulinho rolled into an empty net when a loose ball broke off Messi in stoppage time. Email “Are Real Madrid already out of the La Liga title race?”. Feedback on “Are Real Madrid already out of the La Liga title race?”.